On December 31, 1972, Roberto Clemente, a thirty-seven-year-old baseball player for the Pittsburgh Pirates, boarded a DC-7 aircraft loaded with relief supplies for survivors of a catastrophic earthquake in Managua, Nicaragua. Concerned over reports that the Nicaraguan dictatorship was misusing shipments of aid, Clemente, a native of neighboring Puerto Rico, hoped his involvement would persuade the government to distribute relief packages to the more than 300,000 people affected by the disaster. Shortly after take off, the overloaded aircraft plunged into the Atlantic Ocean, just one mile from the Puerto Rican coast. Roberto Clemente’s body was never recovered. On Monday, April 21, PBS’s AMERICAN EXPERIENCE premieres Roberto Clemente, a one-hour documentary about an exceptional baseball player and committed humanitarian, who challenged racial discrimination to become baseball’s first Latino superstar. From independent filmmaker Bernardo Ruiz, Clemente features interviews with Pulitzer Prizewinning authors David Maraniss (Clemente) and George F. Will (Men at Work: The Craft of Baseball), Clemente’s wife Vera, Baseball Hall of Famer Orlando Cepeda, and former teammates, to present an intimate and revealing portrait of a man whose passion and grace made him a legend. Roberto Clemente’s untimely death brought an end to a spectacular career. In his eighteen seasons with the Pirates, he lead the team to two World Series championships, won four National League batting titles, received the Most Valuable Player award, and earned twelve consecutive Gold Gloves. In his final turn at bat for the 1972 season, Clemente made his 3,000th career hit—an achievement that had been reached by ten major league players before him, and only fifteen since. Born in a poor rural barrio in Puerto Rico in 1934, Clemente grew up “with people who really had to struggle,” he later recalled. An avid baseball player throughout his youth, Clemente was drafted by the Brooklyn Dodgers in 1954 just seven years after Jackie Robinson broke the color barrier in Major League Baseball. As a black Latino, Clemente encountered many of the same obstacles and prejudices as the first African-American ball players. 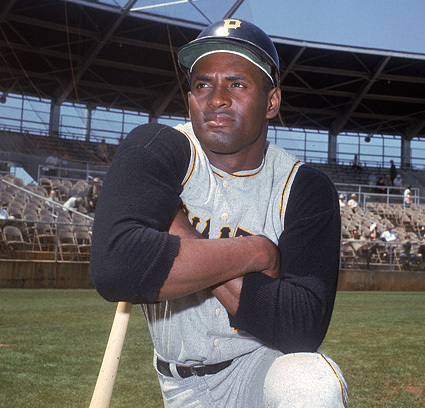 His starting bonus of $10,000 was just a fraction of the amount paid to white draftees, and during his first spring training in Florida in 1955, segregation laws meant that while Clemente’s white teammates relaxed at beaches, swam in pools, and stayed in hotels that didn’t admit blacks, he was frequently forced to find his own lodging, and eat meals on the bus. Roberto Clemente was offended by the racism he encountered in the United States, an injustice he had not experienced growing up in Puerto Rico’s relaxed racial climate. Later in his career, after signing with the Pittsburgh Pirates, Clemente often felt estranged in the blue-collar steel town, where the white majority saw him as a black man, and the African-Americans too labeled him a foreigner. The local sports press often took jabs at the rising star by quoting him in broken English. But by 1964, Clemente led a National League all-star team that featured more Latino players than ever. His success in baseball became an important symbol for the nation’s growing Latino population as he excelled in America’s pastime while still maintaining his Latino identity. Today, seventy percent of foreign-born baseball players in the United States hail from the Dominican Republic, Venezuela, or Puerto Rico. Eventually, Clemente used the podium his fame offered to talk about human rights and his dream to help underprivileged youth in Puerto Rico. During road trips with the Pirates, he routinely stopped to visit sick children in area hospitals. “If you have a chance to accomplish something that will make things better for people coming behind you, and you don’t do that, you are wasting your time on this earth,” he told a Houston audience in 1971, just one year before his death. Bernardo Ruiz has written or produced programming for PBS, TLC, MTV, Discovery Networks and the National Geographic Channel. He has been awarded grants from ITVS, the Corporation for Public Broadcasting, the Paul Robeson Fund for Independent Media, Latino Public Broadcasting, as well as a New York Foundation on the Arts fellowship in Film. He is a founding member of SubCine, a filmmaker-run distributor of independent Latino film & video and is the co-producer of the award-winning “The Sixth Section,”which was supported by grants from the MacArthur Foundation and the Rockefeller Fund. He is at work on a documentary on the life of Roberto Clemente for the award-winning PBS series, American Experience. Clemente Family Photographs, motion picture footage and excerpts provided courtesy of the Clemente family, used with permission. Copyright ©1960 – 2008, 21 In Right, Inc. All Rights reserved. Major League Baseball ® footage used with permission of Major League Baseball Properties, Inc.
Propiedad de El Nuevo Día/Luis Ramos, Ramón Korff, Gary Williams. ©El Nuevo Día. Todos los derechos de autor reservados. The Justo A. Martí Photographic Collection, Archives of the Puerto Rican Diaspora, Centro de Estudios Puertorriqueños, Hunter College, CUNY. Copyright ©2008, Pittsburgh Post-Gazette, All Rights reserved. Reprinted with permission.